This article is a continuation of our series discussing cloud service myths. 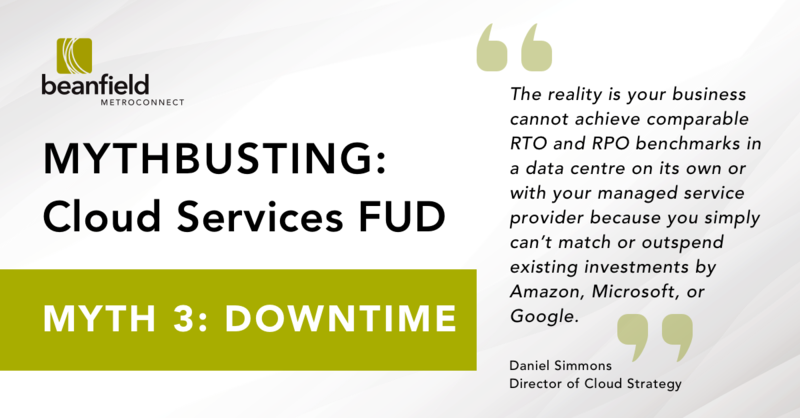 It’s true, cloud services aren’t immune to downtime. Outages happen and can carry serious consequences to businesses. NPR reported that an outage on Amazon Web Services in 2017 cost publicly traded companies $150 million. These high profile events can be misleading and perpetuate the myth that cloud services are less reliable than dedicated colocation or high availability managed services. The very best defence available for unplanned downtime is a solid multi-cloud strategy. By leveraging multiple service providers when implementing your cloud service based disaster recovery plan, you can achieve the lowest possible recovery time objectives (RTO) and recovery point objectives (RPO). The reality is your business cannot achieve comparable RTO and RPO benchmarks in a data centre on its own or with your managed service provider because you simply can’t match or outspend existing investments by Amazon, Microsoft, or Google. Take advantage of their investments and limitless scalability. 100.00% up-time is an achievable service level, but nearly impossible outside of the cloud. Design mission critical services with disaster recovery and high availability architectures spanning multiple cloud providers, not just multi-availability zones or regions. Mirror data sets for mission critical workloads between cloud service providers in real time active-active deployment models. Unify DNS, identity management, and active directory deployments across cloud service providers as a single organization. Implement dedicated connectivity with AWS Direct Connect, Azure ExpressRoute, or Google Cloud Interconnect and leverage multi-cloud connectivity solutions to provide seamless connectivity between cloud vendors, your data, and your users. We will conclude the Mythbusting: Cloud Service FUD series in part four when we discuss Myth #4 – Security & Privacy. You can read the entire series as a single article on Medium here.